FuboTV Review: Is it A Good Streaming Service for the Sports Fan? When we cut the cord on our overpriced cable contract a few years ago, FuboTV didn’t exist. It’s just one of several relatively new streaming services that are giving consumers more choices when it comes to watching TV. As huge football fans, the biggest concern we had when we cut the cord was whether or not we’d be able to watch our favorite college football and NFL games. Football was how DirecTV had roped us into staying an extra year under contract. They hooked us with NFL Sunday Ticket for free for a season worked. We quickly realized that we could watch our teams another way. That’s when we decided to cut the cord. While it meant breaking our contract, it was worth it. Within two months we had made back the $100 or so that it cost to get out from under our expensive cable subscription for good. Now we’d never go back. If you’ve been looking for a reason to cut the cord on your expensive cable contract and you’re a big fan of sports (and in particular soccer), FuboTV could be just the streaming service for you. FuboTV is a streaming service that is focused on sports, news and entertainment channels. When it launched back in 2015, FuboTV was primarily about soccer. And it remains the best online streaming service for watching soccer games. Recently, FuboTV broadened its content offerings to be more like the other popular streaming services out there. Like Sling TV and Hulu Live, it offers many of the most popular channels like HGTV, History Channel, and more. One important channel missing from FuboTV’s lineup is ESPN. That’s right. If you’re looking for a way to watch ESPN without cable, FuboTV isn’t the streaming service for you. However, FuboTV does have Fox Sports channels, the Big Ten Network and the opportunity to catch more niche sports, like cycling. As with any streaming service you’re considering, it’s important to know what channels matter most to you. 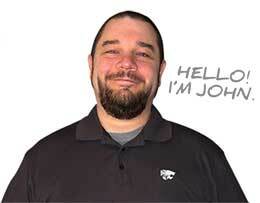 That helps you find the best streaming platform for your needs. Here’s a breakdown of the FuboTV channels. You’ll notice that CNN is missing from that list, as is NBC, CBS, and ABC. You won’t get access to the major networks in all markets. Thankfully, there’s an easy way to get local channels that doesn’t require keeping your pricey cable plan or subscribing to a more expensive streaming service. We get all of our local channels and the major networks for free with our digital antenna. There are plenty of good digital antennas out there. We bought the Mohu Leaf digital antenna for our home and love it. 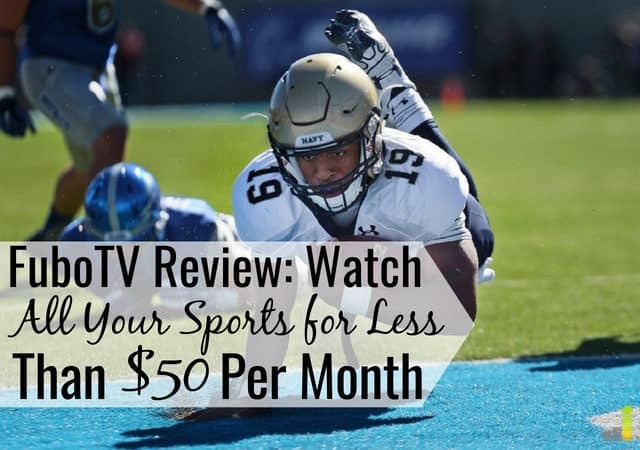 With a one-time cost to purchase of about $40, it’s made it very easy for us to catch our local news as well as the NFL games and college football games broadcast on the major networks. Where FuboTV shines though is exactly where you’d expect it to – in the sports channels it offers. As you can see, there’s a lot to watch on FuboTV. As you consider whether or not it is the right streaming service for you, focus on the types of channels offered and what they cost. Like many other popular streaming services, FuboTV offers a variety of packages and add-on channel packages to tailor their content to your personal preferences. What we like about FuboTV’s base package is that it comes with 80+ live channels, no hidden fees and no contract. Best of all, you can cancel at any time with no fees or charges. FuboTV’s base package costs $44.99 per month. That’s a bit steep, but not out of line with other streaming services and is reasonable considering the wealth of sports content it offers. With the average cable bill coming in north of $110, the FuboTV price will still save you $65 per month. If you’re looking for a way to try FuboTV free, you can sign up for their 7-day free trial. If you don’t like it, cancel and pay nothing. If you are just looking for Spanish language channels, FuboTV offers two packages: Fubo Latino for $17.99 per month and Fubo Português for $19.99 per month. Do you feel like you pay too much for your cable bill or gym membership? Let Trim save you money on the memberships and subscriptions you don’t use. The average Trim user saves $30 per bill with this handy little app! Trim can negotiate lower prices for you with Comcast, Time Warner and more. Try Trim today! While those packages only include 15 and 5 channels, respectively, if you’re looking for Spanish language news, sports and entertainment channels, they may be of value to you. We’re generally not fans of add-on packages because they can eat away at the savings you enjoy by cord cutting. However, they can be a good way to get the best content for your money. 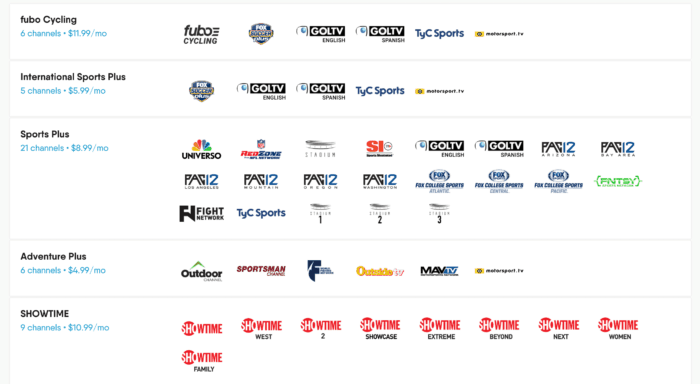 Sports Plus – 21 channel package for $8.99 per month includes: FNTSY Sports Network, Fight Network, FOX College Sports (Atlantic, Central and Pacific channels), GOLTV (English and Spanish versions), NFL RedZone, Pac12 Network (Arizona, Bay Area, Los Angeles, Mountain, Oregon and Washington), Sports Illustrated TV, Stadium 1, 2 and 3, TyC Sports, and Universo. Remember to cross check the packages with your base package to make sure you want and need the channels in the add-on offering. FuboTV’s website makes it easy for you to do this. 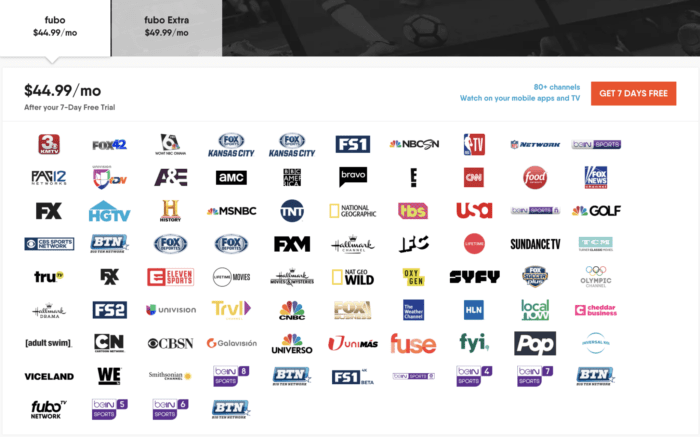 On its site, just select either FuboTV or FuboTV Extra and scroll down to see a list of add-on packages with channels that are already included in the base package you’ve chosen removed. You can also stream FuboTV from your laptop or desktop computer anywhere with an Internet connection. We use the Amazon Fire TV and Amazon Fire TV Stick in our house as they accommodate most streaming services. When we travel, we take our Fire TV Stick with us so we can easily get the content we want without hassle. Plus, a FuboTV subscription comes with the ability to stream on two devices at once. For an extra $5.99 per month, you can expand that to three devices at any given time. Does FuboTV have A DVR? Many potential cord cutters ask is whether the streaming service they’re looking at comes with cloud DVR capability. The good news is that FuboTV comes with a cloud-based DVR included for free. This is a plus since other services like Sling TV charge an extra $5 per month for a DVR. FuboTV includes the ability to record up to 30 hours of programming in its base package. You can also get up to 500 hours of storage by adding the Advanced DVR option for an extra $10 per month. If you watch a lot of sports, the Advanced DVR might be worth the cost to you. Either DVR option is easy to use. In the FuboTV menu, you’ll see a “My DVR” option, which lists everything you’ve recorded by event name, channel name and date. When you see something you want to record, and the DVR option is available, just click it and FuboTV will automatically schedule your recording. I remember back when we had satellite TV, we had to schedule our recordings and time them down to the minute. If a game started late or ended late, we’d miss those parts of the match. With FuboTV, that’s not a concern as it will make sure you get the entire game recorded. Reasonable Price – at $44.99 per month, if you’re a dedicated soccer fan, you won’t get the kind of sports lineup that FuboTV offers anywhere else for that price. Solid Channel Lineup – FuboTV has expanded its content beyond sports to include many popular news, entertainment, and lifestyle channels that people want. This makes the platform a solid choice for more than just soccer fans. Included Cloud DVR – not every streaming service includes a cloud DVR option in its base package; with the easy recording ability already discussed, this is a plus for FuboTV. 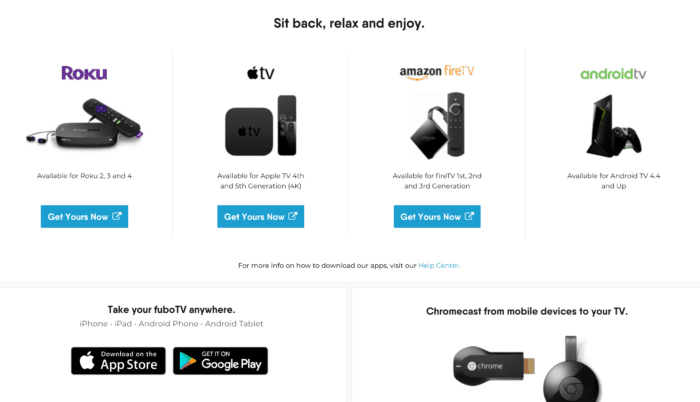 Platform Friendly – FuboTV works with all the mainstream streaming platforms including Amazon FireTV, Apple TV, and Roku. No Fees, No Contracts – This is a given with streaming services and one of the biggest advantages they have over cable and satellite TV. Best Soccer Coverage – FuboTV covers the following soccer leagues and competitions: Premier League, FIFA World Cup, MLS, La Liga, UEFA Champions League, UEFA Europa League, Bundesliga, FA Cup, League Cup, Primera Liga, Brasileirão Série A, Scottish Premiership, Ligue 1, CONMEBOL World Cup Qualifiers, CONCACAF World Cup Qualifiers, UEFA World Cup Qualifiers, NASL, NWSL, Ajax TV, Arsenal TV, Barca TV, Bayern Munich TV, BVB World, Chelsea TV, Everton TV, Real Madrid TV. Clunky interface – over time, the viewing experience can be just as important as the channel lineup so it’s worth noting that the FuboTV interface is rather slim. It would be nice if FuboTV made it easier to record a game from the channel you’re watching or if it had a ‘follow my team’ option to make it easier to catch all of your team’s games in a single click. Plus, navigation and menus are a bit hard to use. While FuboTV excels in its soccer offerings, no ESPN may disappoint most sports fans. Check out our guide on how to watch ESPN without cable to learn how to get their family of channels. 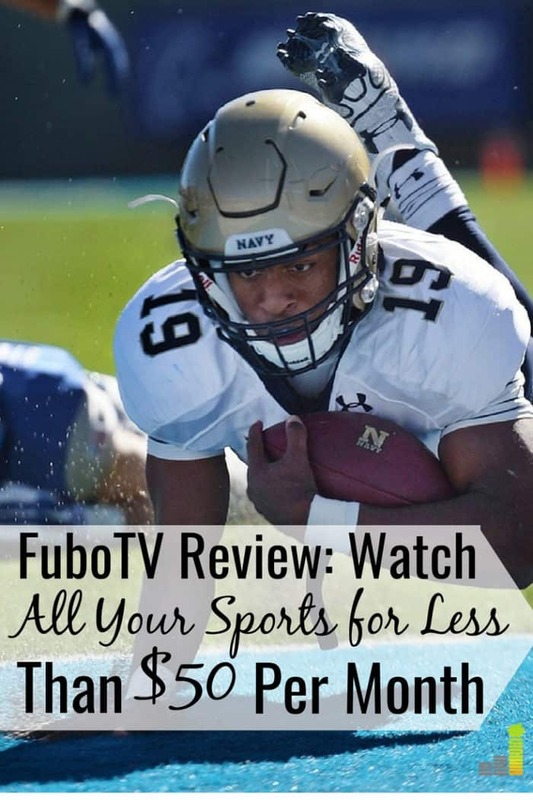 With the pros and cons covered, it’s worth comparing FuboTV to two popular streaming services that we’ve also reviewed on Frugal Rules – Sling TV and Hulu with Live TV to see, at a high level, how FuboTV compares. In addition to having ESPN, the biggest advantage Hulu Live TV has over FuboTV is its on demand content library. You get 60+ live TV channels plus a cloud DVR service and access to Hulu’s entire content library for only $44.99 per month. Pulling out the sports channels on Hulu Live, you’ll get CBS Sports, ESPN, ESPN2, ESPNews, ESPNU, ESPN Goal Line, FS1, FS2, NBCSN, Olympic Channel and the SEC Network. That’s a solid lineup by any sportsfan’s standards and it’s cheaper than FuboTV. Add in that you get Hulu’s original content like the popular Handmaid’s Tale and we think the nod goes to Hulu with Live TV, unless you’re really looking for soccer games and international sports, in which case FuboTV may be the best choice for you. If you want to learn more about Hulu and see if it’s the right streaming service for you, check out our Hulu with Live TV review now. As one of the more popular streaming services on the market, Sling TV offers a solid lineup of sports channels and regional packages that include channels FuboTV doesn’t, like Caribe, Espana, Mexico, and SudAmerica. Additionally, Sling Latino can be purchased for $10 per month and includes all the Univision channels as well as beIN Sports in Spanish and TV Azteca. Probably the biggest reason for a sports fan to choose Sling TV over FuboTV is that you will get ESPN and ESPN 2 in the Sling TV base package for a cost of only $25 per month. Adding its Sports Extra packages for only $5 per month gives you ESPNews and the SEC network along with seven other channels. If you’re interested in learning more about Sling TV, check out our Sling TV Review now. This is a straightforward matter. Like most streaming services, there is no contract with FuboTV, so you can cancel your FuboTV subscription at any time with no penalty, fees or added cost. When it comes to soccer, no one can match FuboTV. Still, at $44.99 per month, for the average sports fan, FuboTV is not going to satisfy. If watching college football without cable or watching NFL games without satellite TV is important to you, FuboTV isn’t the streaming service for you. Instead, consider Hulu with Live TV or Sling TV. If you like soccer, baseball, basketball, golf and other sports and want to be able to enjoy a well-rounded offering of news, entertainment, and lifestyle channels without an expensive cable contract, FuboTV may be the best streaming service for you. What questions do you have about FuboTV that we can answer? Have you tried other streaming services? Which do you like? Which would you avoid and why? If you’re thinking about cutting the cord but haven’t done so yet, what’s holding you back? 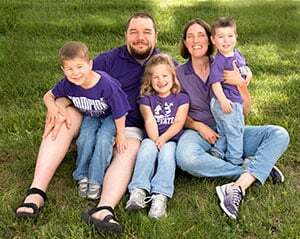 Nicole Schmoll is an experienced professional copywriter who writes regularly for clients in the finance, IT, healthcare, trades and retail industries. Check out samples of her work and services at Ink Harmony.